This item is an image. It was created by an unknown creator on or around the date published: 26/02/1977. Black and white photograph depicting trio seated on steps at the front of wooden home. 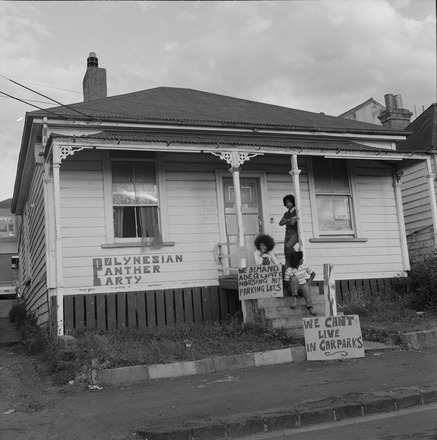 'Polynesian Panther Party' is painted on the front of the house and signs propped up reading 'We demand adequate housing not parking lots' and 'we can't live in car parks'.